In his recent piece, “Why We Need Free Preschools,” Steve Freedman proposes free Jewish early childhood education as the next big project to hold off a rising intermarriage rate. Based on analysis I have done in the greater Boston area, cost is not the issue that is preventing families from enrolling at our centers. Instead, the challenge comes from our centers lacking the coverage that our families need. Changing family dynamics (a rise in dual working partnerships and adults living farther away from parents) are influencing the needs of families with young children as they explore early childhood education (ECE) options. As a result, many of our institutions are struggling to maintain enrollment rates while providing the same services. According to Jdata, which tracks Jewish educational institutions nationwide, this trend has caused more than 50 Jewish ECEs to close their doors since 2010. Concerned about the trend, the Combined Jewish Philanthropies (CJP) commissioned a survey of families with young children to better understand the factors influencing their decision. These findings are the result of analysis that I conducted based on the survey conducted by Professor Mark Rosen. Interestingly unlike Freedman’s argument, the direct costs associated with Jewish ECEs are not one of the significant factors indicated by these data. Families with lower incomes are more likely to indicate that cost is an important factor in their decision; they are also significantly more likely to receive financial aid if they attend a Jewish ECE compared to a secular one. Based on these data in Boston, it appears that existing financial aid allocations are working to address wealth variations, and as a result, there is no difference in enrollment rates by income when controlling for other factors. But we cannot discount “full costs,” a term used by economists to describe indirect costs of an activity, such as time and expenses associated with access. When we consider the full costs of early childhood education, we can begin to understand factors impacting families’ decisions and thus consider ways to better address their needs. Families who needed earlier drop offs or later pick-ups were less likely to choose a Jewish ECE. While some educators prioritize infants and toddlers spending time with their parents at this early age, many families do not have that option. As most Jewish households have two working parents, the lost wages resulting in the shorter work day, as well as the potential future implications on their careers, are more costly in financial terms and priorities than the cost of a full-day ECE. Nationwide, of the 253 ECEs for which Jdata has data, 30 percent operate ten hour days and an additional 20 percent operate eight hour days, leaving half of ECEs offering less than eight hour days. That leaves many parents inadequate time to drop off their child and commute to and from work. Given parents’ needs for full-day coverage, we must ask, instead, if we would rather a child spend a whole day in a Jewish setting rather than in a secular setting. In addition to the length of the school day, Jewish families need ECE coverage at a younger age. Compared to global standards, Americans are given some of the shortest – and often unpaid – maternity and paternity leaves. Fortunate families might be able to stagger their leaves to be home with their child for six months. This time, however, still leaves at least nine months when they require infant care. As a result, families who require infant coverage were less likely to consider a Boston area Jewish ECE, and nationwide fewer than 25 percent of Jewish ECEs nationwide accommodate infants. Once families’ routines are set and relationships are established with the secular staff, they tend not to switch to a Jewish center when their child is of age. The annual schedule of Jewish ECEs presents another indirect cost. Some centers do not offer summer coverage, and most are closed for all of the Jewish holidays. Nearly half of ECEs reporting to Jdata offer 48 or more weeks of coverage. Just fewer than 40 percent offer between 40 to 47 weeks of coverage per year and 15 percent report offering 40 or fewer weeks of early childhood education. Dual working families require year-round ECE coverage, and many parents are unable to miss work for all of the Jewish holidays. While the latter might be a value that a synagogue will be unwilling to change, it is essential that we consider the implication on families who might not observe all the Jewish holidays and the implications these decisions have on their enrollment consideration. Another major factor concerns the age-old real estate adage, “location, location, location.” Families look for ECEs that are geographically convenient. The farther a family lives from a Jewish ECE, the less likely they are to enroll. Longer daily commutes to and from the ECE lead to less time at work or less leisure time in the evenings. It is important to consider our communal role in making educational opportunities easily accessible, especially in areas with an emerging Jewish community. Beyond finances and time, there are other factors that impact a family’s priorities. The data indicates that families prioritizing Jewish education were much more likely to choose a Jewish ECE than those for whom it is not as high a priority. Additionally, families that want to send their child where their friends send their children, as well as families with multiple children were more likely to choose a Jewish ECE. Increased marketing and user-friendly websites were additional factors that could increase enrollments. Families that utilized information fairs were less likely to consider a Jewish ECE; and those who used community Listservs or relied on websites were less likely to choose a Jewish ECE. Jewish ECEs need to consider their public outreach and how families learn about their centers. Interestingly, families with more children were more likely to consider a Jewish ECE. It is unclear how the number of children impacts their decision, but a possible explanation is that families with more children have more opportunities to interact with other families utilizing Jewish ECEs and it is the word-of-mouth marketing that is being measured. (The number of children does not seem to be a measure of religiosity). The needs of our community members have shifted over the past 40-plus years, with more families needing broader ECE coverage, including infant, full-day and full-year care. In some areas, young Jewish families are moving to communities that lack Jewish infrastructure. 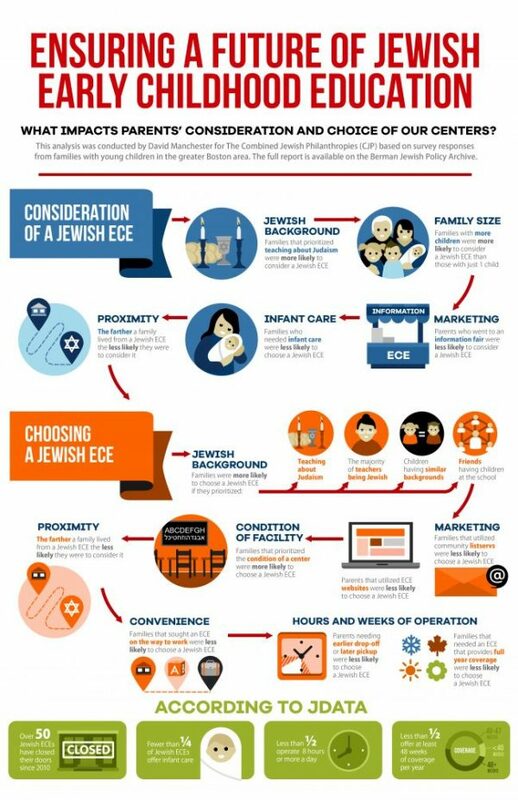 The distance and inconvenience of Jewish ECEs greatly reduces the likelihood these families will access a Jewish ECE. Few of our institutions have shifted their services to accommodate these needs, resulting in reduced enrollments and closed institutions. Reducing costs will encourage some to enroll in a Jewish ECE, however, as Jewish ECEs consider ways to increase enrollment, we must be cognizant of all the needs of the community members we seek to support. The full report prepared for CJP is available on the Berman Jewish Policy Archive. David Manchester is a Ph.D. student at Brandies University’s Heller School for Social Policy & Management where his studies focus on socio-demographic research, as well as program assessment and evaluation in the American Jewish community. He works as a Graduate Research Associate for The Cohen Center for Modern Jewish Studies, where Jdata is housed. He can be reached at Davidman@Brandeis.edu or on twitter @djmanchester.